In Australia, you will find teriyaki chicken sushi in almost every sushi eateries. But there is none in Singapore. Perhaps, it is more adapted for Aussie palate. Here, I made my own teriyaki chicken sprinkled some black and white sesame and rolled it with cucumber strips. 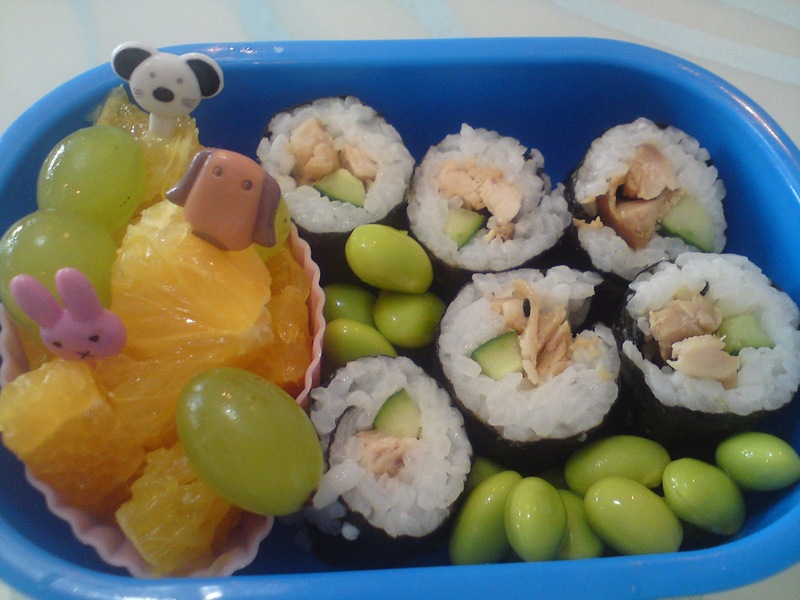 There are also edamame, oranges and grapes in his bento. Recently, my husband and myself are too concerned over my boy's progress of learning after checking out a few preschool that we actually give additional coaching at home. Papa teaches numeric and I, writing alphabets. We seems to be over-reacted during the coaching that my son always ends up tearing if he did not perform well. I felt sorry for the first time and began soul searching - Are we giving too much pressure? I understand from my hubby that it is MOE standards that by four years of age, the kid should be able to write, read and spell a few simple words. This is the reason why we behaved like 'kiasu' parents. I also talked to the teacher at his preschool and am assured my son is progressing and improving everyday. Perhaps, we should be more encouraging and sensitive to his feelings instead of insisting in producing the end-result that we desire.